The interior of Luna Rossa is mostly pleasant. I’m going to break my own restaurant review rules and write this one in a more casual style. I wasn’t planning on reviewing this place, but the experience I had warrants it. This one’s pretty rare. The District shopping center in Tustin, Calif is not the most inviting area, mainly due to the constant traffic jams at peak hours. However, it’s also not without its charms. 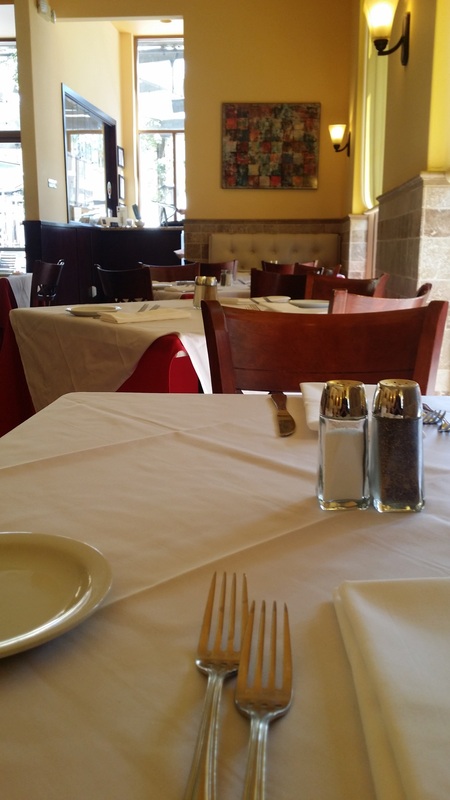 Luna Rossa Ristorante sits on the nicer side of The District, next to other eateries and the AMC movie theater. Whenever I catch a flick to review, I’m always tempted to stop by Luna Rossa as a place to mentally digest the movie while I physically digest an Italian meal. I recently gave in to temptation, and, just like almost every other time I’ve given in, I regretted it. The experience was subpar from beginning to end. Entering the restaurant by the front desk gives the impression that the establishment is a lower tier than it actually is, with clutter in the windows and bric-a-brac at the host station. That’s disappointing because the dining room is actually quite nice, with red and white linen, beautiful tiles, and a comfortable open environment. Unfortunately, the restaurant was severely understaffed when I came in to dine, which was a Saturday afternoon. No one was at the host station to greet me. I had to poke my head in the dining room to get the attention of the single server on duty. The restaurant was nearly empty, so I had my choice of tables, except that a number of the tables hadn’t been cleared or cleaned and still had the previous diners’ dirty plates sitting on them. I assumed those parties had just left and that a busser would come out to clear the plates, but I never saw a busser come out to do so. An older couple came in and sat at the bar, which drew my attention to that area because I hadn’t seen a bartender back there either. I wondered who would serve that couple. It turns out that the lone server was also the bartender! I’ve waited tables before for a number of years, and I know what it’s like to be slammed with three to six tables and just hoping to get through the rush without any complaints. That’s when you rely on the team around you to deliver good service. I couldn’t imagine having to seat my own guests, bus my own tables, make my own cocktails, and also serve every table that walked in. At the very least, I couldn’t imagine doing all that and providing good service. As soon as I understood the staffing situation I adjusted my expectations down accordingly. In a sadistic moment of weakness, I secretly hoped a rush of people would walk in just so I could see how the restaurant would handle it. It’s also important to mention that to help mitigate the problem of not having any hosts to greet guests the restaurant has placed a front desk bell at the host station. Hearing the tinny peal of the tiny bell while eating is not unlike the dining experience at a cheap Chinese restaurant where guests have to summon workers from the kitchen to man the trays of food under the heat lamps. Luna Rossa lost at least one customer who either didn’t see the bell or refused to ring it. After receiving no service for a few minutes, she walked out. Overall, there’s just a general lack of care and polish to Luna Rossa. The menus are just cheap black and white photocopies dressed up in a nice binder. The restaurant is a pleasant environment overall, but little details like rusted air conditioning grates and unprofessional conversation from the kitchen spilling out into the dining room diminish the experience. Even my server, while amiable, didn’t fit the upscale ambience with all of the tattoos running up his arms and neck. And when one of the owners came out to finally assist, she was dressed casually in jeans and a tank top. If this had been some grease pit I stopped by on my way to Vegas, then I wouldn’t care. But when menu prices approach $30 for pasta, then expectations have to be raised. The menu is robust, offering over 50 food items. Normally I would question how a restaurant is able to keep ingredients fresh for such a big menu, but no doubt a lot of the dishes share ingredients, especially the large selection of pizzas. No wine menu was offered, but it can found on the restaurant’s website, and the liquor offerings from the full bar appear to be comprehensive. The calamari was almost tasteless, but definitely overpriced. I ordered water with a lemon wedge to drink and the Calamari Fritti ($15) to start. 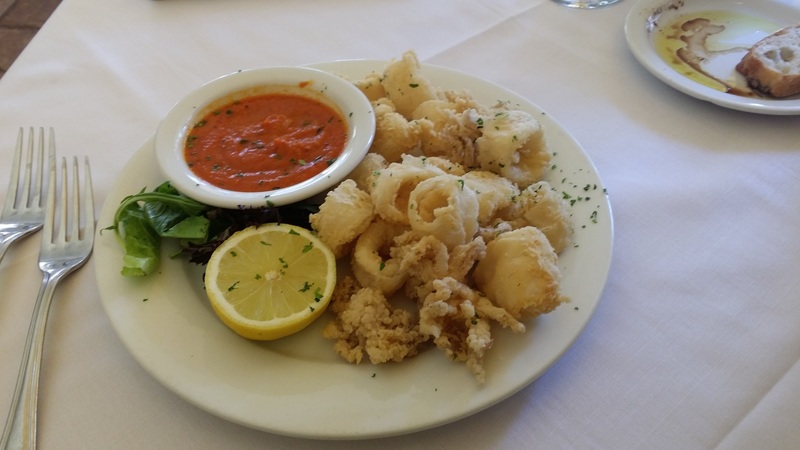 If it’s offered, then I’ll always order the calamari as an appetizer for a restaurant review. It’s an easy dish to prepare, but also an easy one to screw up. I’ll admit that I did balk at the price. At $15 you’re paying more than what you would pay at Ruth’s Chris steakhouse, which is a fine dining establishment and where the calamari is well portioned as an appetizer that’s meant to be shared. Regrettably, Luna Rossa only gives you roughly 20 giant pieces of squid and a small bowl of spicy marinara. That’s almost a dollar per piece folks! And while the calamari was prepared well and the breading nice and flaky, it didn’t have any seasoning. 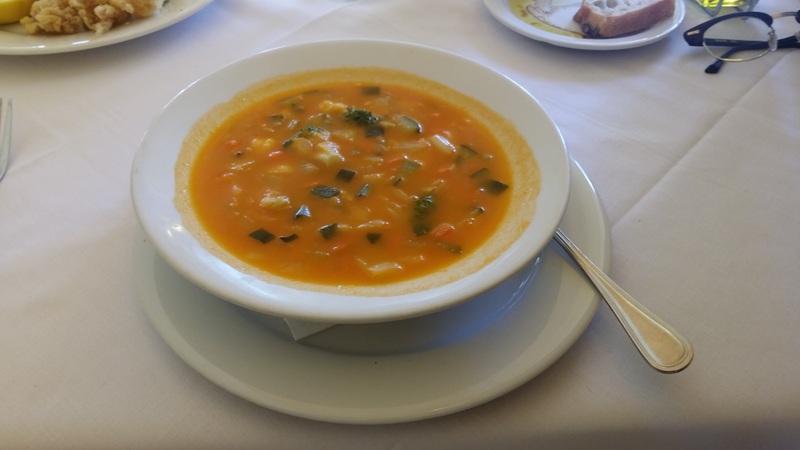 The Minestrone soup ($8) that followed was adequate. The vegetables were crisp and flavorful, but otherwise the soup was very simple. It’s impressive how something can look so appetizing, but taste so bad. For my entrée, I asked my tattooed server for what he recommended, and he pointed me to the Tortellacci Ripieni di Brasato di Manzo Al Tartufo Nero ($26). 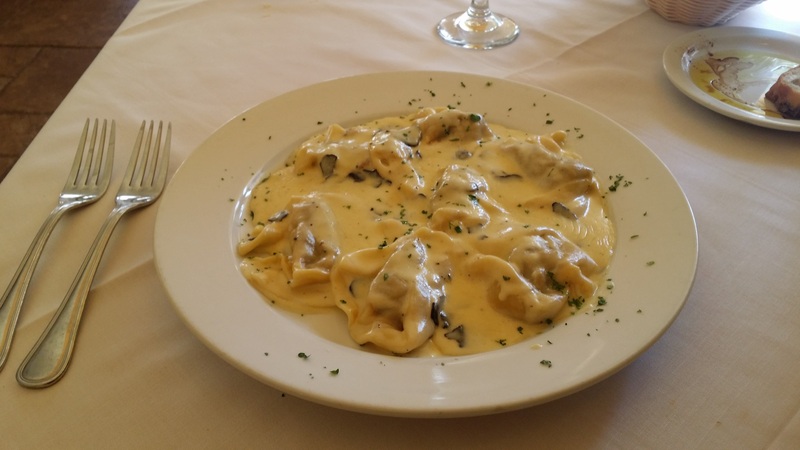 The dish is composed of tortellacci stuffed with red wine braised beef short ribs, covered in shaved black truffle and alfredo sauce. It sounded interesting so I ordered it. Regrettably, this was probably the most disappointing part of the meal. The tortellacci are huge! So only about eight pieces actually fit on the plate, which breaks down to roughly $3 per piece. That wouldn’t be a point of criticism if the pasta was actually stuffed with short rib. But you’re actually just getting maybe a tablespoon of meat in the middle of a teacup saucer of pasta. And even the meat was suspect. I dissected one tortellacci to see exactly what I was getting. While there were definitely some meat chunks, the majority of the filling was closer to some unidentifiable meat paste. When I ate the meat filling alone, it wasn’t particularly flavorful. Now the alfredo sauce was just a travesty. Not only is it slathered over everything, but it tastes off. Some of the Yelp! reviews describe the flavor as “bitter”, which was my initial reaction as well, but I think there’s more to it than that. I tried eating the sauce by itself, trying to separate the flavors on my tongue, but to no avail. The flavor is indescribably bad. My glasses for size comparison. Still surrounded by tables that had not been cleared, and with the tortellacci disaster still fresh in my mouth, I wanted to end on a high note. 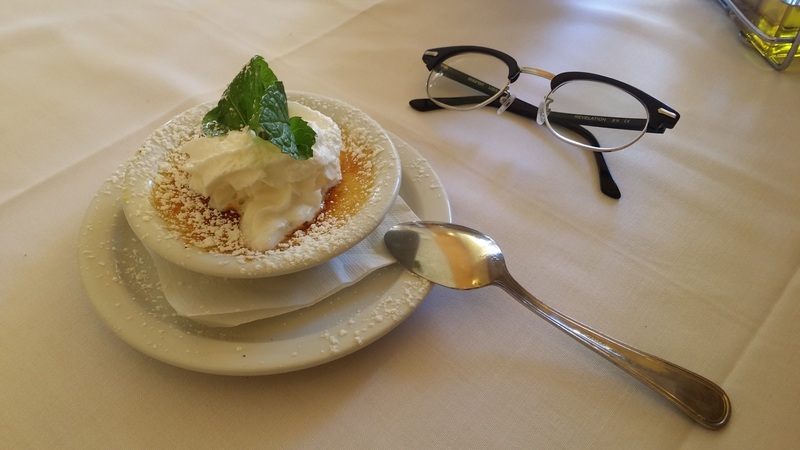 I ordered my favorite dessert Crème Brule. Luna Rossa offers it in mini ($4) and regular ($8) sizes. I desperately wanted the regular size, if for no other reason than to rinse the taste out of my mouth with something sweet, but I was deathly afraid that the restaurant would somehow mess up blowtorching sugar. So I ordered the mini. I’m glad I did, because it was terrible. The second it came out covered in whipped cream I was worried. I brushed it aside and tasted the dish proper. I don’t know how they did it, but they managed to make Crème Brule tasteless. I tried eating the caramelized sugar by itself and it was like eating plastic. Then I scooped out some of the custard and it was like eating a sponge. I’m glad that I had ordered the mini and saved myself $4, but I think the restaurant came out ahead anyway, because the custard is only about 1/3 of an inch thick at its deepest section and is served in a bowl about the size of a silver dollar pancake and slopes inward generously. Whipped cream dollop aside, one could easily finish this dessert in two spoonfuls. I’ve never been to a restaurant that literally left a bad taste in my mouth. When I left, I immediately went to a coffee shop just to have something normal tasting again. Honestly and without any intended mean-spiritedness, I’m impressed that a restaurant like Luna Rossa remains in business. They must have other dishes that taste good, if the positive reviews on Yelp! are to be believed. The margins on their food must also be very high. And they’re probably saving a small fortune by operating with a less-than-skeleton crew. Good for them for finding a business model that works for them, but their customers will definitely find a better dining experience for the same amount of money elsewhere.